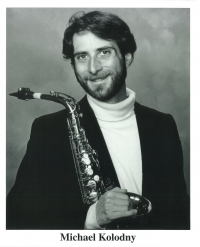 Michael Kolodny is Artist Associate in Jazz Saxophone at Williams and studied at the Aaron Copland School of Music and with tenor saxophonist Warne Marsh. He has performed at the Blue Note and Carnegie Hall in his native New York City, and has appeared with Joe Hunt, Cecil Brooks III, Ellis Marsalis, and other jazz masters. Along with his wife, vocalist Laura Pierce, Michael co-directs Jazz Insight, a leading voice for jazz listener education, and through Jazz Insight has given presentations on jazz listening and audience development at many schools and other venues, including the International Association of Jazz Educators conference and the Discover Jazz Festival. Michael has taught music since 1978, including private lessons, workshops, master classes and middle and high school jazz band. His latest recording is a course on listening to jazz called I Love Jazz – A Quick Guide to Jazz Listening. The CD features Michael on sax, along with drummer Jimmy Cobb, pianist James Williams, bassist Harvie S, and vocalist Laura Pierce.